Try making a geometric photo frame montage to brighten up any space and create an eye catching wall display. It's a great way to display lots of photos, artwork, postcards or even interesting pieces of fabric. The images can be switched over quickly when you want a refresh. Selection of 4"x6" and 5" x 7" clip frames. (I used 26 frames total for a wall length of approx 2 metres). 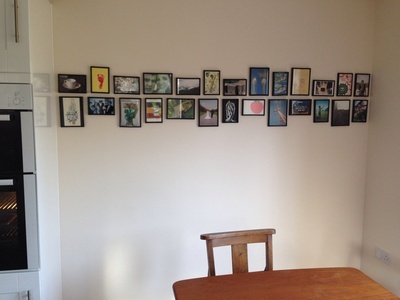 Photos, artwork, postcards or interesting fabric pieces to fill the frames. Think about the space you want to fill and how to lay out the frames. I had a rectangular alcove and chose to accentuate this with a long thin wall-to-wall display. 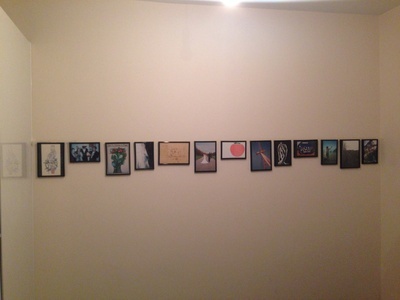 I hung all the frames either above or below a horizontal band to create an interesting shape. I used masking tape to mark out the central band and then fixed in pins above or below depending on the size and aspect of each frame. I left a masking tape width between each frame. 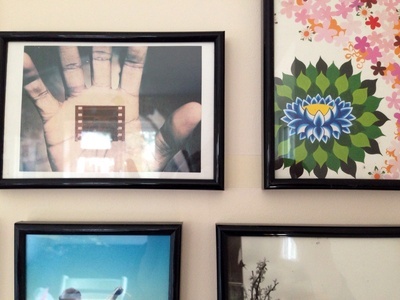 Do you have a fun picture frame montage on your wall? Please share a picture of your creation via the comments forum.